In the heart of the Trossachs, the Scottish Wool Centre sits in the shadow of Craigmore hill in Aberfoyle village, just a scenic drive from Ben Lomond. 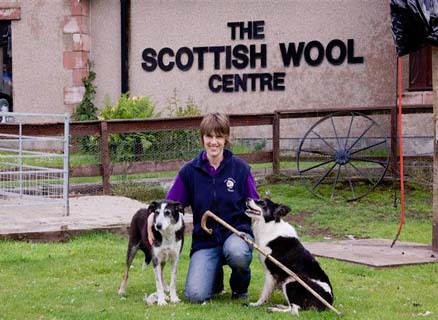 Here you will find the Scottish Wool Centre where you can discover the story of Scottish Wool. You can also visit the Spinner's Cottage and try your hand at making wool into yarn in the traditional way. We are situated in Aberfoyle, the gateway to one of the most beautiful areas in Scotland. Local shepherds appear seven days a week with their Border collies to provide sheepdog demonstrations. You can also wander around our outside paddocks where there are rare breeds of sheep, goats plus the miniature horses, Calamity and Merlin. If birds are your interest, there is a birds of prey area, fan tailed doves in the dovecot, plus a pond area with various breeds of hens for you to see or to buy. More active visitors can play crazy golf or enjoy the kid’s park, next to the beer garden. Visit the Lomond Restaurant for fabulous food before moving on to the large retail area. This has something for everyone, from cashmere, Harris Tweed, country and casual wear plus many gifts to take home including a large range of whisky in the food and whisky hall. Don't forget to tell all your friends about The Scottish Wool Centre experience.